English poet, born at Somersby, Lincolnshire, on the 6th of August 1809. He was the fourth of the twelve children of the Rev. George Clayton Tennyson and his wife Elizabeth Fytche. The Tennysons were an old Lincoinshire family settled at Bayon's Manor. The poet's grandfather, George Tennyson, M.P., had disinherited the poet's father, who was settled hard by in the rectory of Somersby, in favor of the younger son, Charles Tennyson D'Eyncourt. The rich pastoral scenery of this part of Lincolnshire influenced the imagination of the boy, and is plainly reflected in all his early poetry, although it has now been stated with authority that the localities of his subject-poems, which had been ingeniously identified with real brooks and granges, were wholly imaginary. At a very early age he began to write in prose and verse. At Christmas 1815 he was sent to the grammar school at Louth, his mother having kept up a connection with this typical Lincolnshire borough, of which her father, the Rev. Stephen Fytche, had been vicar. Tennyson was at this school for five years, and then returned to Somersby to be trained by his father. In the rectory the boys had the run of an excellent library, and here the young poet based his wide knowledge of the English classics. The news of Lord Byron's death (19th April 1824) made a deep impression on him: it was a day, he said, when the whole world seemed to be darkened for me; he went out into the woods and carved "Byron is dead" upon a rock. Tennyson was already writing copiously -- "an epic of 6000 lines" at twelve, a drama in blank verse at fourteen, and so on: these exercises have, very properly, not been printed, but the poet said of them at the close of his life, "It seems to me, I wrote them all in perfect metre." The family was in the habit of spending the summer holidays at the coast of the county, commonly at Mablethorpe, and here Tennyson gained his impressions of the vastness of the sea. FitzGerald very justly attributed the landscape character of Tennyson's genius to the impress left on his imagination by "old Lincolnshire, where there were not only such good seas, but also such fine hill and dale among the wolds." In 1827 Frederick Tennyson, the eldest surviving brother, uniting with his younger brothers Charles and Alfred, published at Louth an anonymous collection of Poems by Two Brothers. The two were Charles and Alfred (whose contributions predominated), and who shared the surprising profits, £20. On the 20th February 1828 Charles and Alfred matriculated at Trinity College, Cambridge, where Frederick was already a student. The poet subsequently told Edmund Gosse that his father would not let him leave Somersby until, on successive days, he had recited from memory the whole of the odes of Horace. The brothers took rooms at 12 Rose Crescent, and afterwards moved into Trumpington Street (now 157 Corpus Buildings). They were shy, and made at first few friends; but they gradually gathered selected associates around them, and Alfred grew to be looked up to in Cambridge "as to a great poet and an elder brother" by a group which included Richard Chenevix Trench, Monckton Milnes (Lord Houghton), James Spedding, W. H. Thompson, Edward FitzGerald, W. H. Brookfield, and, above all, A. H. Hallam (1811-1833). Charles Tennyson afterwards took the additional name of Turner. He published four volumes of sonnets which have been highly praised. In June 1829 Alfred Tennyson won the Chancellors prize medal for his poem called "Timbuctoo." With great imperfections, this study in Miltonic blank verse displays the genius of a poet, in spite of a curious obscurity both of thought and style. Here are already both richness and power, although their expression is not yet clarified by taste. But by this time Tennyson was writing lyrics of still higher promise, and, as Arthur Hallam early perceived, with an extraordinary earnestness in the worship of beauty. The results of this enthusiasm and this labor of the artist appeared in the volume of Poems, chiefly Lyrical, published in 1830. This book would have been astonishing as the production of a youth of twenty-one, even if, since the death of Byron six years before, there had not been a singular dearth of good poetry in England. Here at least, in the slender volume of 1830, was a new writer revealed, and in "Mariana", "The Poet", "Love and Death", and "Oriana", a singer of wonderful though still unchastened melody. Through these, and through less perfect examples, was exhibited an amazing magnificence of fancy, at present insufficiently under control, and a voluptuous pomp of imagery, tending to an over-sweetness. The veteran Samuel Taylor Coleridge, praising the genius in the book, blamed the metrical imperfection of it. For this criticism he has himself constantly been reproved, and Tennyson (whose impatience of anything like censure was phenomenal) continued to resent it to the end of his life. Yet Coleridge was perfectly just in his remark; and the metrical anarchy of the "Madelines" and "Adelines" of the 1830 volume showed that Tennyson, with all his delicacy of modulation, had not yet mastered the arts of verse. In the summer of 1830 Tennyson and Hallam volunteered in the army of the Spanish insurgent Torrijos, and marched about a little in the Pyrenees, without meeting with an enemy. He came back to find his father ailing, and in February 1831 he left Cambridge for Somersby, where a few days later Dr. George Tennyson died. The new incumbent was willing that the Tennysons should continue to live in the rectory, which they did not leave until six years later. Arthur Hallam was now betrothed to Emily Tennyson (afterwards Mrs. Jesse, 1811-1889), and stayed frequently at Somersby. This was a very happy time, and one of great physical development on Alfred's part. He took his share in all kinds of athletic exercises, and it was now that Brookfleld said, "It is not fair that you should be Hercules as well as Apollo." This high physical zest in life seems to have declined after 1831, when his eyes began to trouble him, and he became liable to depression. The poetical work of these three years, mainly spent at Somersby, was given to the world in the volume of Poems which (dated 1833) appeared at the end of 1832. This was certainly one of the most astonishing revelations of finished genius ever produced by a young man of less than twenty-four. Here were to be read "The Lady of Shalott", "The Dream of Fair Women", "Oenone", "The Lotos-Eaters", "The Palace of Art", and "The Miller's Daughter", with a score of other lyrics, delicious and divine. The advance in craftsmanship and command over the materiel of verse shown since the volume of 1830 is absolutely astounding. If Tennyson had died of the savage article which presently appeared in the Quarterly Review, literature would have sustained terrible losses, but his name would have lived forever among those of the great English poets. Indeed, it may be doubted whether, in several directions, he ever surpassed the glorious things to be found in this most exquisite and most precious book. It was well that its publication was completed before the blow fell upon Tennyson which took for a while all the light out of him. In August 1833 Arthur Hallam started with his father, the great historian, for Tirol. They went no farther than Vienna, where Hallam, returning to the hotel on the 15th of September 1833, found his son lying dead on a sofa: a blood-vessel had broken in his brain. His body was brought back to England, and buried at Clevedon on the 3rd of January 1834. These events affected Tennyson extremely. He grew less than ever willing to come forward and face the world; his health became "variable and his spirits indifferent." The earliest effect of Hallam's death upon his friend's art was the composition, in the summer of 1834, of The Two Voices; and to the same period belong the beginnings of the Idylls of the King and of In Memoriam, over both of which he meditated long. In 1835 he visited the Lakes, and saw much of Hartley Coleridge, but would not "obtrude on the great man at Rydal", although "Wordsworth was hospitably disposed." Careless alike of fame and of influence, Tennyson spent these years mainly at Somersby, in a uniform devotion of his whole soul to the art of poetry. In 1837, to their great distress, the Tennysons were turned out of the Lincolnshire rectory where they had lived so long. They moved to High Beech, in Epping Forest, which was their home until 1840. The poet was already engaged, or "quasi-betrothed", to Emily Sellwood, but ten years more had to pass before they could afford to marry. At Torquay, in 1838, he wrote Audley Court on one of his rare excursions, for he had no money for touring, nor did he wish for change: he wrote at this time, "I require quiet, and myself to myself, more than any man when I write." In 1840 the Tennysons moved to Tunbridge Wells, and a year later to Boxley, near Maidstone, to be close to Edmund Lushington, who had now married Cecilia Tennyson. Alfred was from this time more and more frequently a visitor in London. In 1842 the two-volume edition of his Poems broke the ten years' silence which he had enforced himself to keep. Here, with many pieces already known to all lovers of modern verse, were found rich and copious additions to his work. These he had originally intended to publish alone, and an earlier privately printed Morte d'Arthur, Dora, and other Idylls, of 1842, is the despair of book-collectors. Most of those studies of home-life in England, which formed so highly popular a section of Tennyson's work -- such as "The Gardener's Daughter", "Walking to the Mail", and "The Lord of Burleigh" -- were now first issued, and, in what we have grown to consider a much higher order, "Locksley Hall", "Ulysses", and "Sir Galahad." To the older and more luxurious lyrics, as reprinted in 1842, Tennyson did not spare the curbing and pruning hand, and in some cases went too far in restraining the wanton spirit of beauty in its youthful impulse. It is from 1842 that the universal fame of Tennyson must be dated; from the time of the publication of the two volumes he ceased to be a curiosity, or the darling of an advanced clique, and took his place as the leading poet of his age in England. Among the friends whom he now made, or for the first time cultivated, were Thomas Carlyle, Rogers, Charles Dickens, and Elizabeth Barrett Browning. Material difficulties now, however, for the first time intruded on his path. He became the victim of a certain "earnest-frothy" speculator, who induced him to sell his little Lincolnshire estate at Grasby, and to invest the proceeds, with all his other money, and part of that of his brothers and sisters, in a "Patent Decorative Carving Company": in a few months the whole scheme collapsed, and Tennyson was left penniless. He was attacked by so overwhelming a hypochondria that his life was despaired of, and he was placed for some time under the charge of a hydropathic physician at Cheltenham, where absolute rest and isolation gradually brought him around to health again. The state of utter indigence to which Tennyson was reduced, greatly exercised his friends, and in September 1845, at the suggestion of Henry Hallam, Sir Robert Peel was induced to bestow on the poet a pension of £200 a year. Never was public money expended in a more patriotic fashion. Tennyson's health slowly became restored, and in 1846 he was hard at work on The Princess; in the autunn of this year he took a tour in Switzerland, and saw great mountains and such "stateliest bits of landskip" for the first time. In 1847 nervous prostration again obliged him to undergo treatment at Prestbury: "They tell me not to read, not to think; but they might as well tell me not to live." Dr. Gully's water-cure was tried, with success. The Princess was now published, in a form afterwards considerably modified and added to. Carlyle and FitzGerald "gave up all hopes of him after The Princess", or pretended that they did. It was true that the bent of his genius was slightly altered, in a direction which seemed less purely and austerely that of the highest art; but his concessions to public taste vastly added to the width of the circle he now addressed. The home of the Tennysons was now at Cheltenham: on his occasional visits to London he was in the habit of seeing William Makepeace Thackeray, Coventry Patmore, Robert Browning and William Charles Macready, as well as older friends, but he avoided "society." In 1848, while making a tour in Cornwall, Tennyson met Robert Stephen Hawker of Morwenstow, with whom he seems -- but the evidence is uncertain -- to have talked about King Arthur, and to have resumed his intention of writing an epic on that theme. In his absent-minded way Tennyson was very apt to mislay objects; in earlier life he had lost the manuscript of Poems, chiefly Lyrical, and had been obliged to restore the whole from scraps and memory. Now a worse thing befell him, for in February 1850, having collected into one "long ledger-like book" all the elegies on Arthur Hallam which he had been composing at intervals since 1833, he left this only manuscript in the cupboard of some lodgings in Mornington Place, Hampstead Road. By extraordinary good chance it had been overlooked by the landlady, and Coventry Patmore was able to recover it. In this way In Memoriam was dragged back from the very verge of destruction, and could be published, in its original anonymous form, in May 1850. The public was at first greatly mystified by the nature and object of this poem, which was not merely a chronicle of Tennyson's emotions under bereavement, nor even a statement of his philosophical and religious beliefs, but, as he long afterwards explained, a sort of Divina Commedia, ending with happiness in the marriage of his youngest sister, Cecilia Lushington. In fact, the great blemishes of In Memoriam, its redundancy and the dislocation of its parts, were largely due to the desultory manner of its composition. The poet wrote the sections as they occurred to him, and did not think of weaving them together into a single poem until it was too late to give them real coherency. The metre, which by a curious naïveté Tennyson long believed that he had invented, served by its happy peculiarity to bind the sections together, and even to give an illusion of connected movement to the thought. The sale of Tennyson's poems now made it safe for him to settle, and on the 13th of June 1850 he was married at Shiplake to Emily Sarah Sellwood. Of this union no more need be said than was recorded long afterwards by the poet himself, "The peace of God came into my life before the altar when I wedded her." Every species of good fortune was now to descend on the path of the man who had struggled against bad luck so long. William Wordsworth died, and on the 19th of November 1850 Queen Victoria appointed Tennyson poet laureate. The salary connected with the post was very small, but it had a secondary value in greatly stimulating the sale of his books, which was his main source of income. The young couple took a house at Warninglid, in Sussex, which did not suit them, and then one in Montpelier Row, Twickenham, which did better. In April 1851 their first child was born dead. At this time Tennyson was brooding much upon the ancient world, and reading little but Milton, Homer and Virgil. This condition was elegantly defined by Carlyle as "sitting on a dungheap among innumerable dead dogs." In the summer of 1851 was made the tour in Italy, of which The Daisy is the immortal record. Of 1852 the principal events were the birth of his eldest son Hallam, the second Lord Tennyson, in August, and in November the publication of the Ode on the Death of the Duke of Wellington. In the winter of 1853 Tennyson entered into possession of a little house and farm called Farringford, near Freshwater, in the Isle of Wight, which he leased at first, and afterwards bought: this beautiful place, ringed around with ilexes and cedars, entered into his life and colored it with its delicate enchantment. In 1854 he published The Charge of the Light Brigade, and was busy composing Maud and its accompanying lyrics; and this volume was published in July 1855, just after he was made D.C.L. at Oxford: he was received on this occasion, which may be considered his first public appearance, with a "tremendous ovation." The reception of Maud from the critics, however, was the worst trial to his equanimity which Tennyson had ever had to endure, nor had the future anything like it in store for him. He had risen in Maud far above his ordinary serenity of style, to ecstasies of passion and audacities of expression which were scarcely intelligible to his readers, and certainly not welcome. It is odd that this irregular poem, with its copious and varied music, its splendid sweep of emotion, its unfailing richness of texture -- this poem in which Tennyson rises to heights of human sympathy and intuition which he reached nowhere else, should have been received with bitter hostility, have been styled "the dead level of prose run mad", and have been reproved more absurdly still for its "rampant and rabid bloodthirstiness of soul." There came a reaction of taste and sense, but the delicate spirit of Tennyson had been wounded. For some years the world heard nothing from him; he was at Farringford, busying himself with the Arthurian traditions. He had now become an object of boundless personal curiosity, being already difficult to find, and the center of amusing legends. It was in 1857 that Bayard Taylor saw him, and carried away the impression of a man "tall and broad-shouldered as a son of Anak, with hair, beard and eyes of southern darkness." This period of somewhat mysterious withdrawal from the world embraced a tour in Wales in 1857, a visit to Norway in 1858, and a journey through Portugal in 1859. In 1857 two Arthurian poems had been tentatively and privately printed, as Enid and Nimue, or the True and the False, to see how the idyllic form would be liked by the inner circle of Tennyson's friends. In the summer of 1859 the first series of Idylls of the King was at length given to the world, and achieved a popular success far beyond anything experienced before by any English poets, save perhaps Byron and Scott. Within a month of publication, 10,000 copies had been sold. The idyls were four in number, "Enid", "Vivien" (no longer called "Nimue"), "Elaine" and "Guinevere." These were fragments of the epic of the fall of King Arthur and the Table Round which Tennyson was so long preparing, and which he can hardly be said to have ever completed, although nearly thirty years later he closed it. The public and the critics alike were entranced with the "sweetness" and the "purity" of the treatment. A few, like John Ruskin, were doubtful about "that increased quietness of style"; one or two already suspected that the "sweetness" was obtained at some sacrifice of force, and that the "purity" involved a concession to Victorian conventionality. It was not perceived at the time that the four idyls were parts of a great historical or mystical poem, and they were welcomed as four polished studies of typical women: it must be confessed that in this light their even perfection of workmanship appeared to greater advantage than it eventually did in the general texture of the so-called "epic." In 1859 "Boadicea" was written, and "Riflemen, Form!" published in The Times. Urged by the Duke of Argyll, Tennyson now turned his attention to the theme of the Holy Grail, though he progressed with it but fitfully and slowly. In 1861 he travelled in Auvergne and the Pyrenees, with Clough, who was to die a few months later; to this year belong "Helen's Tower" and the "Dedication" of the Idylls to the prince consort, "These to his Memory." The latter led to Tennyson's presentation in April 1862 to the queen, who "stood pale and statue-like before him, in a kind of stately innocence", which greatly moved his admiring homage. From this time forth the poet enjoyed the constant favor of the sovereign, though he could never be moulded into a conventional courtier. He now put the Arthurian legends aside for a time, and devoted himself to the composition, in 1862, of "Enoch Arden", which, however, did not appear until 1864, and then in a volume which also contained "Sea Dreams", "Aylmer's Field" and, above all, "The Northern Farmer", the first and finest of Tennyson's remarkable studies in dialect. In April of this year Giuseppe Garibaldi visited Farringford; in February 1865 Tennyson's mother died at Hampstead in her eighty-fifth year; in the ensuing summer he travelled in Germany. The time slipped by with incidents but few and slight, Tennyson's popularity in Great Britain growing all the time to an extent unparalleled in the whole annals of English poetry. This universality of fame led to considerable practical discomfort; he was besieged by sightseers, and his nervous trepidation led him perhaps to exaggerate the intensity of the infliction. In 1867 he determined to make for himself a haven of refuge against the invading Philistine, and bought some land on Blackdown, above Haslemere, then a secluded corner of England; here James Knowles began to build him a house, ultimately named Aldworth. This is the time of two of his rare, privately printed pamphlets, The Window; or, the Loves of the Wrens (1867), and The Victim (1868). The noble poem Lucretius, one of the greatest of Tennyson's versified monographs, appeared in May 1868, and in this year The Holy Grail was at last finished; it was published in 1869, together with three other idyls belonging to the Arthurian epic, and various miscellaneous lyrics, besides Lucretius. The reception of this volume was cordial, but not so universally respectful as that which Tennyson had grown to expect from his adoring public. The fact was that the heightened reputation of Browning, and still more the sudden vogue of Algernon Charles Swinburne, Morris and Rossetti (period 1866-70), considerably disturbed the minds of Tennyson's most ardent readers, and exposed himself to a severer criticism than he had lately been accustomed to endure. He went on quite calmly, however, sure of his mission and of his music. His next volume (1872), Gareth and Lynette and The Last Tournament, continued, and, as he then supposed, concluded The Idylls of the King, to the great satisfaction of the poet, who had found much difficulty in rounding off the last sections of the poem. Nor, as he was to find, was the poem yet completed, but for the time being he dismissed it from his mind. In 1873 he was offered a baronetcy by Gladstone, and again by Disraeli in 1874; in each case the honor was gracefully declined. Believing that his work with the romantic Arthurian epics was concluded, Tennyson now turned his attention to a department of poetry which had long attracted him, but which he had never seriously attempted -- the drama. He put before him a scheme, which he cannot be said to have carried far, that of illustrating "the making of England" by a series of great historical tragedies. His Queen Mary, the first of these chronicle-plays was published in 1875, and played by Sir Henry Irving at the Lyceum in 1876. Although it was full of admirably dramatic writing, it was not theatrically well composed, and it failed on the stage. Extremely pertinacious in this respect, the poet went on attempting to storm the theater, with assault upon assault, all practically failures until the seventh and last, which was unfortunately posthumous. To have really succeeded on the stage would have given Tennyson more gratification than anything else, but he was not permitted to live long enough to see this blossom also added to the heavy garland of his glory. Meanwhile Harold, a tragedy of doom, was published in 1876; but, though perhaps the finest of its author's dramas, it has never been acted. During these years Tennyson's thoughts were largely occupied with the building of Aldworth. His few lyrics were spirited ballads of adventure, inspired by an exalted patriotism -- "The Revenge" (1878), "The Defence of Lucknow" (1879) -- but he reprinted and finally published his old suppressed poem, The Lover's Tale, and a little play of his, The Falcon, versified out of Boccaccio, was produced by the Kendals at their theater in the last days of 1879. Tennyson had reached the limits of the age 70, and it was tacitly taken for granted that he would now retire into dignified repose. In point of fact, he now started on a new lease of poetical activity. In 1880 he published the earliest of six important collections of lyrics, this being entitled Ballads and other Poems, and containing the sombre and magnificent "Rizpah" In 1881 The Cup and in 1882 The Promise of May, two little plays, were produced without substantial success in London theaters: the second of these is perhaps the least successful of all the poet's longer writings, but its failure annoyed him unreasonably. This determination to be a working playwright, pushed on in the face of critical hostility and popular indifference, is a very curious trait in the character of Tennyson. In September 1883 Tennyson and Gladstone set out on a voyage around the north of Scotland, to Orkney, and across the ocean to Norway and Denmark. At Copenhagen they were entertained by the king and queen, and after much fêting, returned to Gravesend: this adventure served to cheer the poet, who had been in low spirits since the death of his favorite brother Charles, and who now entered upon a phase of admirable vigor. During the voyage Gladstone had determined to offer Tennyson a peerage. After some demur, the poet consented to accept it, but added, "For my own part, I shall regret my simple name all my life." On the 11th of March 1884 he took his seat in the House of Lords as Baron Tennyson of Aldworth and Farringford. He voted twice, but never spoke in the House. In the autumn of this year his tragedy of Becket was published, but the poet at last despaired of the stage, and disclaimed any hope of "meeting the exigencies of our modern theater." Curiously enough, after his death Becket was the one of all his plays which enjoyed a great success on the boards. In 1885 was published another interesting miscellany, Tiresias and other Poems, with a posthumous dedication to Edward FitzGerald. In this volume, it should be noted, The Idylls of the King was completed at last by the publication of "Balin and Balan"; it contained also the superb address "To Virgil." In April 1886 Tennyson suffered the loss of his second son, Lionel, who died in the Red Sea on his return from India. The untiring old poet was steadily writing on, and by 1886 he had another collection of lyrics ready, Locksley Hall Sixty Years After, etc. ; his eyes troubled him, but his memory and his intellectual curiosity were as vivid as ever. Late in 1888 he had a dangerous attack of rheumatic gout, from which it seemed in December that he could scarcely hope to rally, but his magnificent constitution pulled him through. He was past eighty when he published the collection of new verses entitled Demeter and other Poems (1889), which appeared almost simultaneously wilh the death of Browning, an event which left Tennyson a solitary figure indeed in poetic literature. In 1891 it was observed that he had wonderfully recovered the high spirits of youth, and even a remarkable portion of physical strength. His latest drama, The Foresters, now received his attention, and in March 1892 it was produced at New York, with Miss Ada Rehan as Maid Marian. During this year Tennyson was steadily engaged on poetical composition, finishing "Akbar's Dream", "Kapiolani" and other contents of the posthumous volume called The Death of Oenone (1892). In the summer he took a voyage to the Channel Islands and Devonshire; and even this was not his latest excursion from home, for in July 1892 he went up for a visit to London. Soon after entering his eighty-fourth year, however, symptoms of weakness set in, and early in September his condition began to give alarm. He retained his intellectual lucidity and an absolute command of his faculties to the last, reading Shakespeare with obvious appreciation until within a few hours of his death. 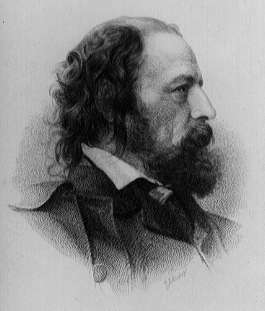 With the splendor of the full moon falling upon him, his hand clasping his Shakespeare, and looking, as we are told, almost unearthly in the majestic beauty of his old age, Tennyson passed away at Aldworth on the night of the 6th of October 1892. Cymbeline, the play he had been reading on the last afternoon, was laid in his coffin, and on the 12th he was publicly buried with great solemnity in Westminster Abbey. Lady Tennyson survived until August 1896. Aldworth House, Hazlemere, Surrey, England.